One of the downsides of managing a property that has been abused in the past is dealing with erosion issues. But, as the old saying goes, crisis = opportunity. 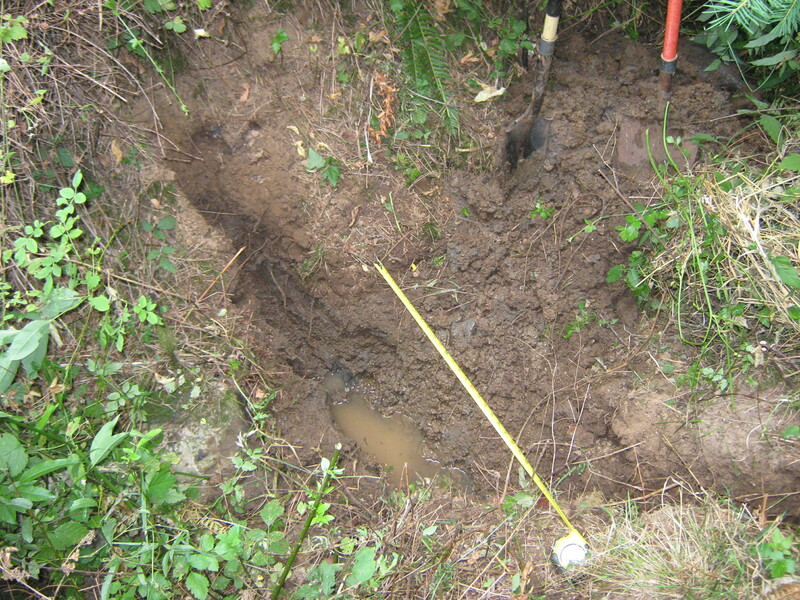 Our property was overgrazed heavily in past years, to the point that some of the wet areas were eroded over 10 feet in some places. This irreplaceable soil ended up in our local creeks and rivers, and most of it now sits in the bottom of the Pacific ocean. 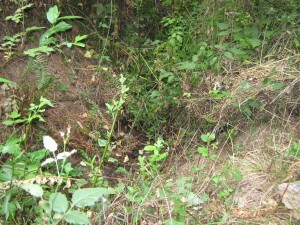 Meanwhile, the land responds by forming a gully, which is unstable and drains the local water table. We’ve taken several measures in the past to fix these gullies, in fits and starts, mostly with the planting of willows to stabilize the beds of the channels. 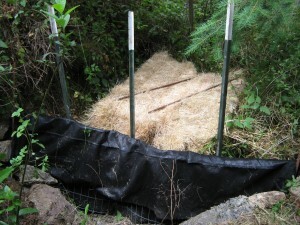 This year, I (along with technical help from friends at Waterways Consulting) ramped up the effort to keep our winter rainfall from draining away quite as fast. Hopefully, these grade control structures will raise the bed level of our seasonal creeks, and provide water for farm and wildlife later into the summer. 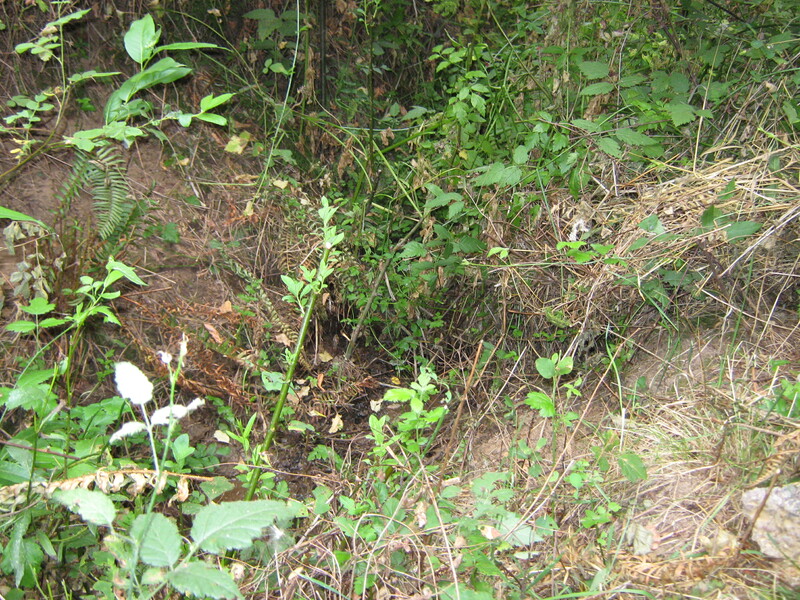 This pic is the site before I worked on it, except for clearing some native blackberries. It’s my highest priority for increasing water supplies, since it’s just upstream of our ram pump intake. If this treatment works as envisioned, there’s 4-5 locations upstream of here to implement more of these practices. First, the channel was trenched it’s entire width and into the banks, around 8″ into each bank, and a little less into the bed of the channel. All of the fill generated was placed upstream. , to span the channel. Dog optional. 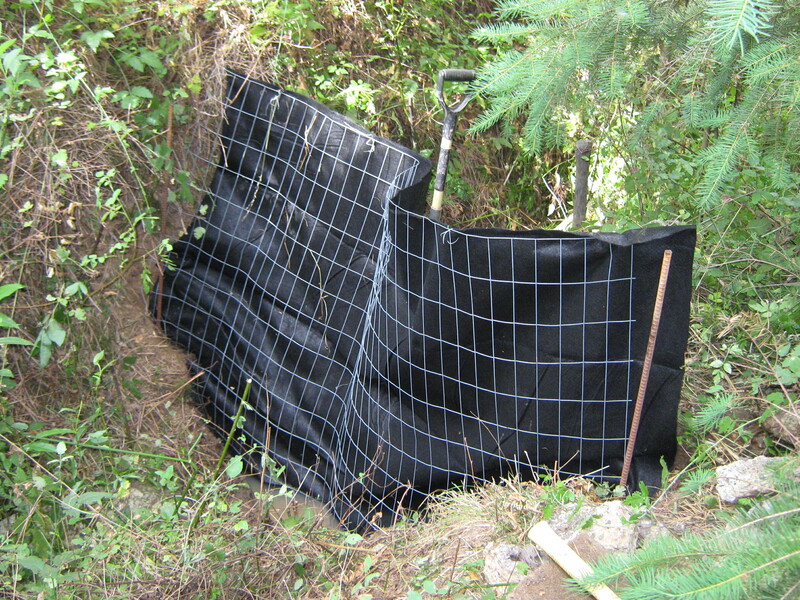 Attach the fence to the filter fabric, using wire or zip ties. Make sure that the fabric is on the upstream end of the fencing so that flows will push it onto the fence. The more holes you make in the fabric, the more points of failure you’ll have, but if you don’t have enough, the fabric could come loose. I did 1 tie every 24″ or so. 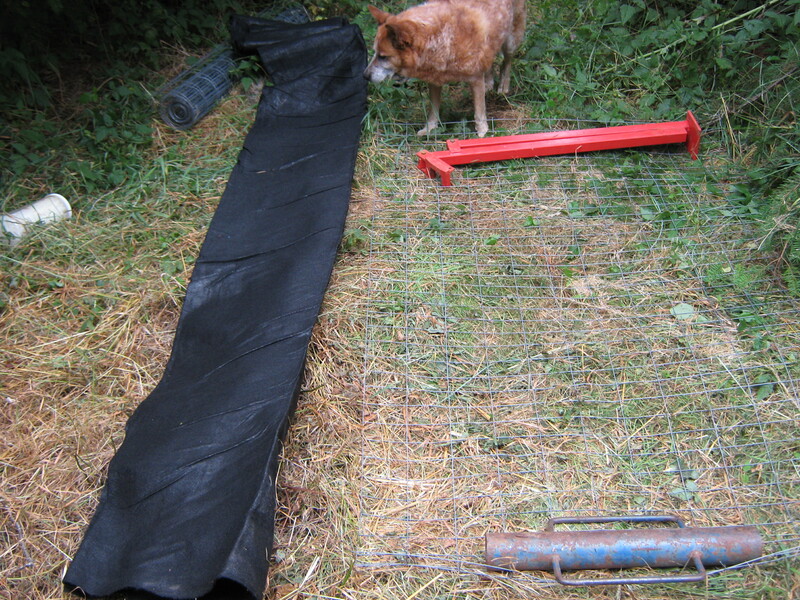 Place the fence-fabric piece into the trench, and spike the fence into the banks with rebar. 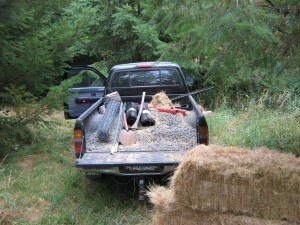 Seal the ends and bottom with 3/4″- (three-quarter minus) gravel…I used about a third of a half-yard pickup load for this. 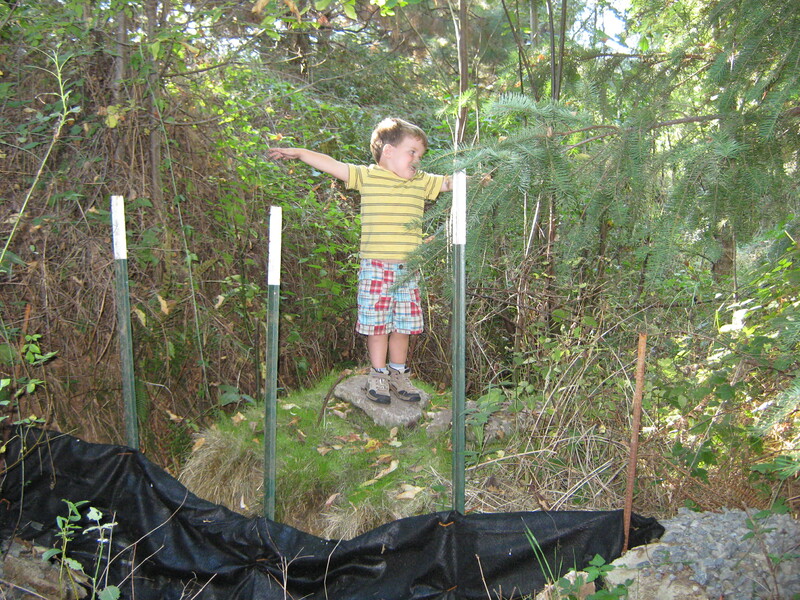 Put some on both sides of the fencing, but put the most on the upstream side (the downstream side may wash away). 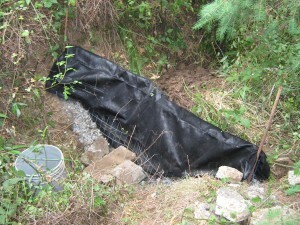 Use some rocks or urbanite pieces to create a splash apron for the water to exit the structure safely. The top, or crest of the structure should be at, or slightly below, the grade of the lowest adjacent bank. The left bank in the picture is ~5′ higher than the right one, so the right one is the one we want to make sure we have the right level on. You can see the gravel and some of the salvaged concrete splash apron installed. Placing it on grade with the right bank will allow overflow to flow onto what was presumably a floodplain/wet meadow in the past. The water, even at it’s most destructive, is shepherded onto land that can spread and absorb it. 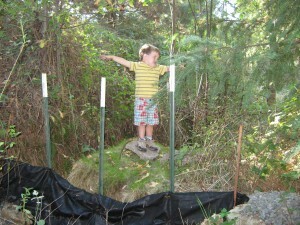 Next, install t-posts to hold the fabric-fence structure. I should have put them downstream of the structure, but some existing concrete was already in the channel, and I wouldn’t have been able to pound through that. I’ll need to tie it together tighter, and watch it during high water. The straw/old hay bales go in next, to provide volume and roughness for sediment to deposit onto, as well as provide plants with a place to establish. We’ve used bales for erosion control in the past in this area, and when they work, it’s great, but in some conditions, high water will make them buoyant, and once they float, they’ll head downstream, taking out a lot of works in their path. 2 pieces of rebar spiked into them at an angle, and some additional concrete on top of them to prevent floating, should do the trick. Tie the fence to the posts in multiple locations. Add more gravel to the upstream side of the structure. 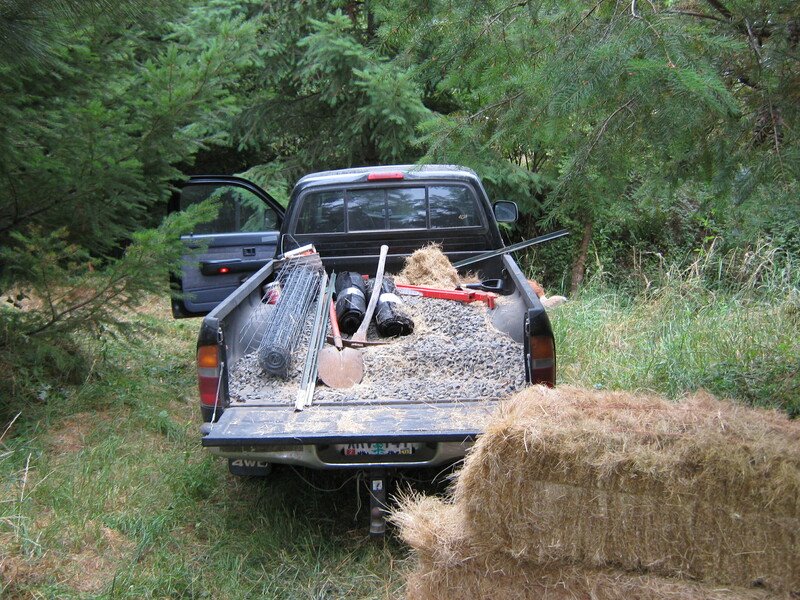 I added some along the sides of the bales, and some against the structure itself. Once the water starts flowing, I’ll monitor it and see where the water is flowing, and adjust accordingly with rocks, concrete scraps, and/or gravel. It’s a little bit too early to tackle the next step, the willow staking. Ideally, as soon as the leaves come off of the local willow grove of choice, they are ready to cut. 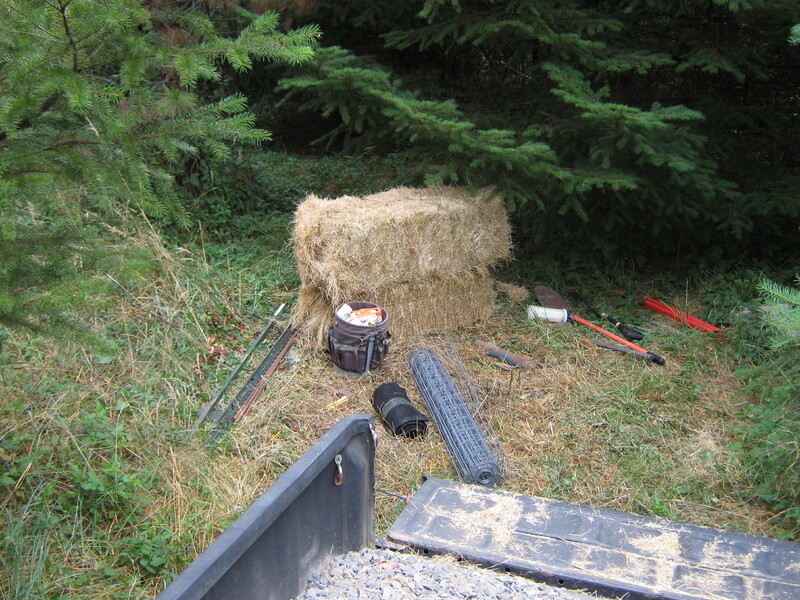 2′-3′ lengths, 1″ in diameter, stuck into the bank in and around the straw bales, will provide root strength, which will ultimately be what holds this all together long-term. And the final step is to wait for the rains to return, and watch it during high water. Some of my favorite pastimes. I’ll lay in a supply of rebar, gravel, and broken concrete in the event that the wooly winter that’s been forecast comes to fruition. 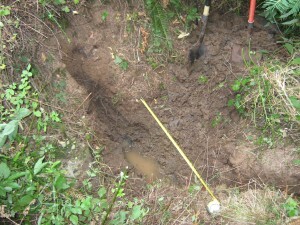 I googled “measuring wet meadow gully incision” and found your website. Awesome Rich! I am sharing this with Martyn. Good work. Hey Katherine…thanks! Let me know if you need any help. One thing to keep in mind is that it’s probably not terribly compatible with livestock, at least for the first few years while it stabilizes, and the willows grow up. There are options, though. Are you planning on updating on the progress? 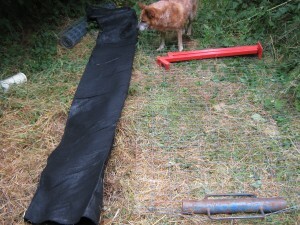 I am about to suggest a similar solution to my neighbour but geotextile fabric is hard to come by in Germany. So it would be wise to know the results before ordering. Thanks a bunch for the photos as well.